In 2016, Elizabeth Freeman Center provided help and support to 318 survivors of sexual assault, including responding 40 times to local hospitals and police stations to support someone immediately after a sexual assault had occurred. Sexual violence affects us, our friends, our neighbors, our children, our classmates, our coworkers, our communities. It does not discriminate – it happens to people of all races, beliefs, income levels, genders, and ages. Nationally, 1 in 6 women, 1 in 33 men, and nearly 1 in 2 people who are transgender, genderqueer, or gender-nonconforming have experienced sexual violence. April 6th: Central County Rally – Park Square, Pittsfield, 4-6pm. Shatter the silence! Signs provided or bring your own. April 6th: White Ribbon Day at MCLA – MCLA Quad, 12:15-12:30pm. Take the pledge and wear the ribbon to end gender based violence. April 7th: Burger Night for Elizabeth Freeman Center – Otto’s Breakfast & Deli, 95 East St, Pittsfield, 5-8pm. All proceeds benefit EFC. April 10th: The Hunting Ground film showing and panel discussion – Sullivan Lounge, Massachusetts College of Liberal Arts (MCLA), 6pm. Free. April 20th: North County Rally – in front of City Hall, North Adams, 4-6pm. Shatter the silence! Signs provided or bring your own. April 22nd: Consent to Dance – Latin Night fundraiser for Elizabeth Freeman Center by Berkshire Salsa, Italian ITAM Lodge, 93 Waubeek Rd, Pittsfield, 7pm-1am. $15, or $12 with student ID. April 26th: Free Self-Defense Class – Unitarian Universalist Church, 175 Wendell Ave, Pittsfield, 6-8pm. RVSP to Colleen at (413) 499-2425 x625 or colleenn@elizabethfreemancenter.org. April 26th: Take Back the Night March at MCLA – MCLA Quad, 8pm. April 27th: South County Rally and Panel – First Congregational Church, 251 Main St, Great Barrington. 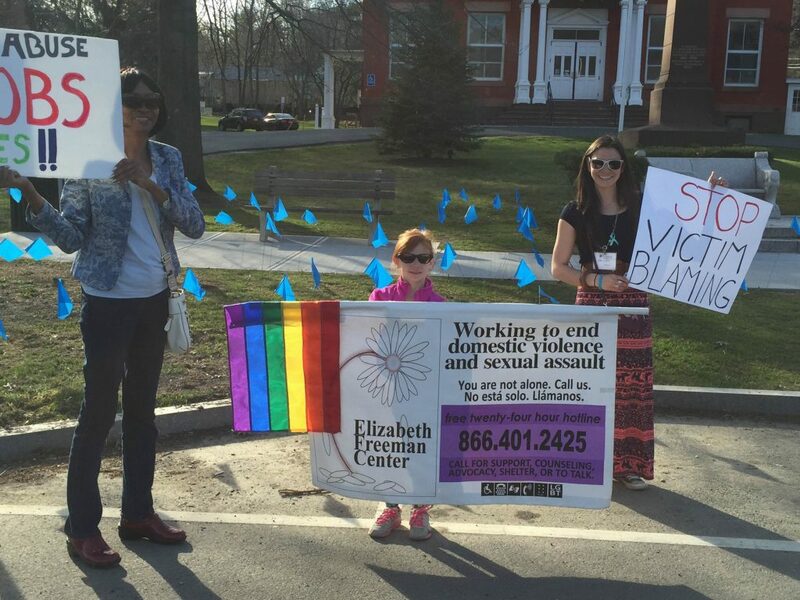 Rally, 4-6pm, outside of the church, followed by panel on Community Responses to Sexual Assault, 6-8pm, in the church. Throughout the month of April: Mildred Elley is offering a teal hair extension to interested parties for a small $5 donation OR a donation of non-perishable food items- all proceeds/donations to benefit Elizabeth Freeman Center. Contact Katie at Elizabeth Freeman Center – (413) 499-2425 x618 or katies@elizabethfreemancenter.org to learn more about any of these events.